The trade unions and staff associations that have members in the NHS are now consulting them up until the end of June on a three-year pay offer backdated to April 1. The offer also includes changes to the national NHS pay, terms and conditions, Agenda for Change(AfC), which has been under negotiation for some time. This offer if accepted will determine the pay, terms and conditions of those directly employed in the NHS over the next three years and beyond. This announcement came after a long battle from health unions and staff associations in a "pay up" campaign, most notably the overturning of a "no strike" clause of the Royal College of Nursing by their 52,000 members in May 2017. This was linked to the overall campaign by trade unions and the TUC to "scrap the cap" for all workers which had been imposed by the Coalition government in 2010. In November 2017, the Chancellor of the Exchequer confirmed that he intended to end the 1% annual cap on AfC. However, in making his announcement to end the imposed pay cap, both the Chancellor and Health Secretary Jeremy Hunt also announced that additional funding could only be made available to the NHS for a multi-year pay deal provided that "boosts productivity", and addressed recruitment and retention. The NHS Staff Council comprising of NHS employers and representatives of the 14 trade unions and staff associations, after months of negotiation, have agreed to consult their members on a Framework Agreement on the proposed reform of AfC but also linked to a three-year pay proposal. One of the trade unions, the GMB, has already come out against the agreement, especially as it applies to the ambulance service, whilst others are recommending it to members, although most say that their members will decide in consultative ballots. For example, Unison, which is the largest health union, has endorsed the recommendation of the Framework Agreement and pay offer at its Health Conference Brighton this week whilst saying all of its members will have an individual consultative ballot which will decide the matter. However, at Unison's health conference there was considerable opposition in the vote on an agreement that links changes in the AfC to the pay offer. In particular, although the change to the terms and conditions will uplift lower paid members above the living wage and lessen the number of increments for new staff to access higher pay, it also links the change in terms and conditions to a pay offer in which around 50% of staff that are now at the top of their increments will receive less over the three years than projected inflation rates. The estimated forecast for inflation is around 9% for the same three years. These staff will certainly not make up the estimated upwards of 14% they have lost over the period of the pay cap due to inflation over the last eight years. Yet it is the collective nature of health workers in a national health service that, even with such a complicated proposal which benefits some more than others, the main consideration at the forefront is how to remain united at a time when the government is running down the Health Service as it attempts to attack national pay and conditions and wreck and dismantle the NHS in favour of giving full rein to the neo-liberal agenda in health care. Whilst the AfC framework proposal has breached the government's 1% pay cap, the government says that it will only invest £4.2 billion to pay for the "cost" of the offer if this proposal is accepted. If it is not accepted, then NHS employers and unions will have no guarantee that a new offer would be funded. In other words, it is the government that is forcing the issue of linking the framework agreement on AfC to the pay increase. So firstly, looking at the offer as it presently stands from the point of view of the health workers and the trade unions that they are organised in, it can be seen that even if the offer is accepted this can only be temporary. For example, a spokesperson for Unite the union pointed out: "Unite welcomes many aspects of this deal, on which we will be consulting our membership over the next couple of months. 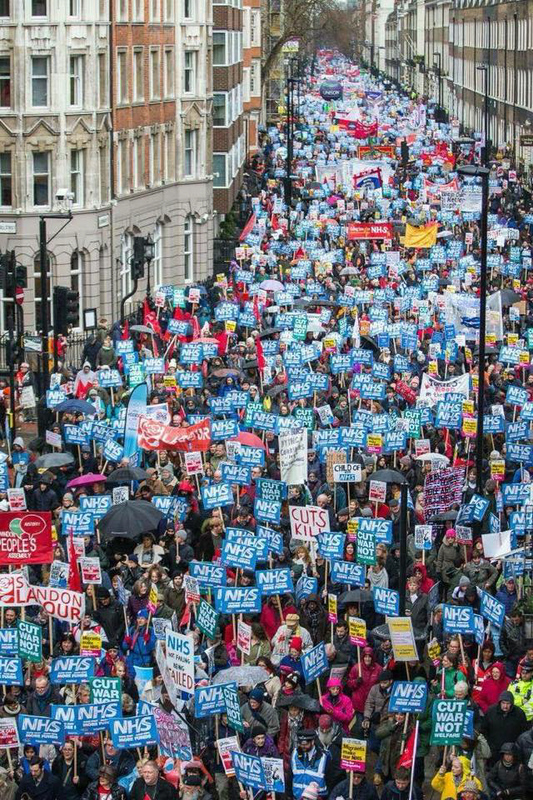 However, we regard this as the start, not the end, of the journey for true pay justice for NHS staff, which we will campaign for with vigour in the coming months and years." Also, it could only be temporary as the fight is also continuing when government and NHS England are encouraging Trusts to transfer particularly non-clinical staff into private wholly owned subsidiary companies with new terms and conditions to get around and undercut their own national pay that they have presently negotiated with the trade unions in AfC! Thousands of health workers including clinical staff who have been transferred to these companies will not receive the AfC Framework agreement changes. The fight is on against staff being transferred to these NHS Trust private companies and to bring staff back into NHS pay, terms and conditions. Secondly, in taking forward this fight, the whole working class and people must not allow the government to present NHS staff as a "cost and burden" to the tax payer. Everyone can see that this framework deal still vastly undervalues the labour of all that work in the NHS on behalf of society. But what is not understood, through this disinformation, is the fact that health staff like all workers are not a "cost and a burden" to the socialised economy but are part of creating value in the socialised economy by curing people when sick and injured and keeping healthy the human resources of society and all those who live and work in it. For example, this new value is consumed by big corporations in keeping their workforces healthy, but is expropriated by them and not passed onto government as a claim that can then be used to fund the NHS. On the contrary these corporations expect the state and individual taxpayer to pay for it, or people to pay and fend for themselves. Thirdly, in taking forward this fight health workers must reject the government's claim that the pay terms and conditions of health workers need to be changed to "boost productivity". This has nothing to do with the innovations in treatment that have the potential to improve health care systems and increasing the number of patients, and types of conditions treated. This is instead, in the hands of the government, a code word for their agenda to continue to cut the NHS workforce further and save any "investment" they are making in addressing the pay cap, rather than addressing it properly and with a serious plan for recruitment and retention of staff in the NHS to meet the needs of health care services for all. As one commentator said on the Framework agreement and recruitment: "The thinking is to persuade those with their career ahead of them to stay, but it doesn't send a great message to those with the most experience." Trust employers are increasingly treating sickness absence as a disciplinary matter regardless of health issues and the new AfC agreement says it will bar those in a disciplinary process receiving their pay increments. Add to this the well-documented serious problem of overwork and staff stress and "presentee-ism" illnesses caused by these policies in the NHS which is causing staff to burn out and leave at ever increasing rates. Last year more than half of the 33,000 nurses who left the service were under 40 years old. In fact, this shortage of nurses and clinical staff is cynically being manipulated by government and NHS England to justify the closure of vital services at District hospitals deepening the crisis of access of patients to health care further at their local hospital and the closure of more and more much needed hospital beds. The determination from health workers has meant that pay cap has been broken. 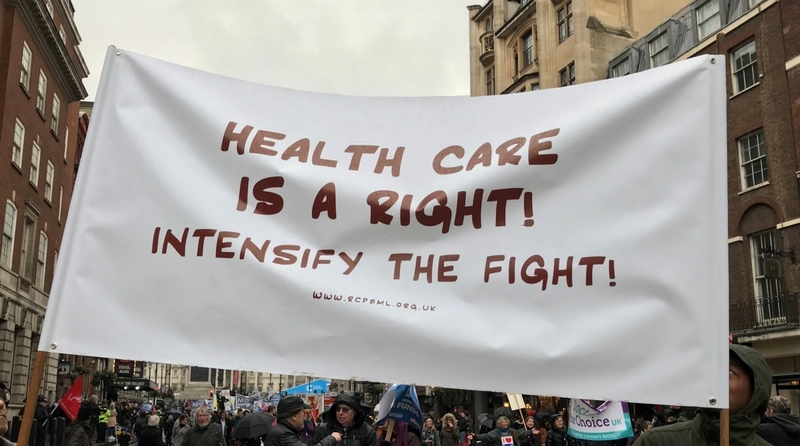 Nevertheless, the fight remains in the future and this is connected with safeguarding the future of the NHS, of which fighting for decent remuneration for health workers must be a part. It is a step forward that health workers have broken the pay cap. Let us now together fight to safeguard the future of health services for our society. Those on the top two increments of their band will only receive a a 6.5 % rise over three years plus a 1.3% rise as a non consolidated lump sum in April 2019. The 6.5% is made up of 3 per cent in 2018/19, 1.7 per cent in 2019/20 and 1.67 per cent in 2020/21. The prediction for inflation over these 3 year is around 9% with nothing in the agreement that can revisit this if this figure goes higher. 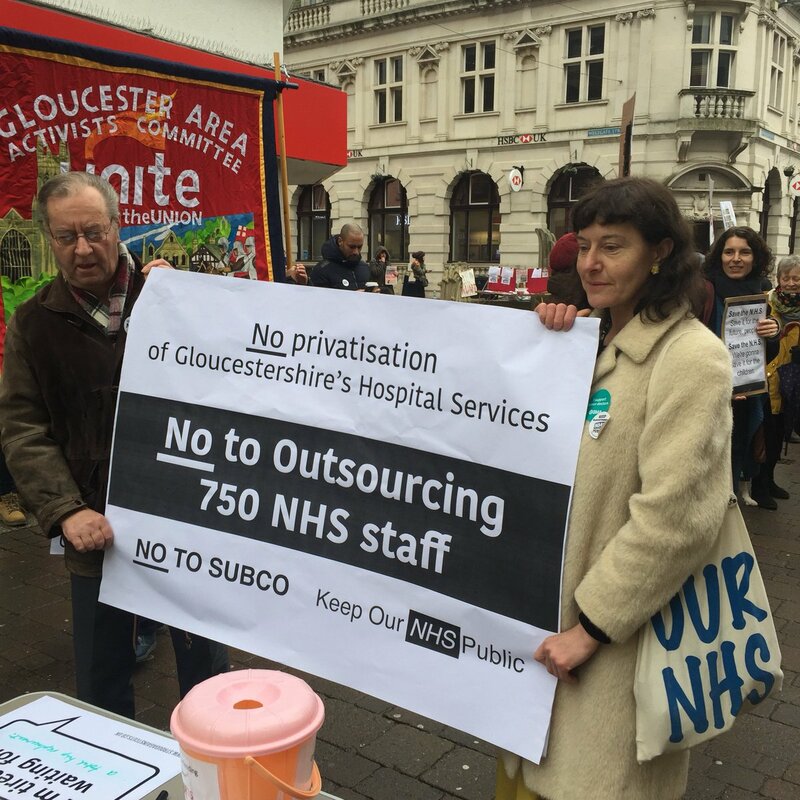 "Health Workers Take Up the Fight Against the Capital Centred Direction of the Hospital Trust Subsidiary Companies"